Sumptuously Sweet DIY Vanilla Solid Perfume - Amphora Aromatics Ltd – Supplier of pure essential oils and aromatherapy Products. All this week we’re giving you suggestions for homemade gifts in the shape of DIY solid perfumes. Today – sumptuously sweet Vanilla! If you’re after something romantic, sweet and sensuous then this may be the recipe for you! This beautifully rich scent is made up of Vanilla Extract oil, Rose Otto absolute and Lavender essential oil. Solid perfumes are surprisingly easy to make and people love receiving a home-made gift. They really appreciate the extra effort and that personal touch! Before making your perfume, it’s a good idea to pre-blend your essential oils in a separate bottle. This gives you more opportunity to adjust the quantities of your blend until you’re happy with the balance of the scent. It also makes it easier to add the blend straight to your base mixture when it’s on the boiler. Some empty jars or tins to put the perfume in. The amount of drops can be adjusted according to taste. For example, if you’re looking for a more earthy tone then increase the amount of Lavender and reduce the amount of Vanilla. Place the beeswax in a bowl and suspend over simmering water. Melt gently and then add the carrier oil. Stir well until the oil is completely absorbed in the beeswax. Remove from the heat and add your essential oil blend. Stir well again before pouring into the containers. Allow to set (this should take between 1 and 2 hours). And you’re done! Did you know? 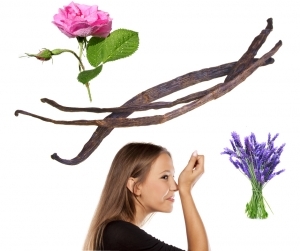 Vanilla is the only member of the Orchid family of flowers that produces an edible fruit.